Bradley Natural Childbirth is a 12 week comprehensive childbirth education series based upon the findings of Dr. Robert Bradley. He likened the success and effectiveness of a birthing woman to that of growing up on a farm where he and his father would tuck the animals into the stable at night and often return to find a foal or calf the next morning. He realized, like animals, if women were well hydrated, well nourished, well rested, felt safe, secure and loved, their bodies would respond in a normal way during birth. Some 26 years and 13,000 babies later, the success of implementing solid nutrition, relaxation techniques, a trusted and trained partner, adequate water intake and rest proved him correct. The Bradley Method of Natural Childbirth continues with an 86% success rate globally. Our story is funny, in that it was a total fluke that we took Bradley classes for the birth of our daughter. 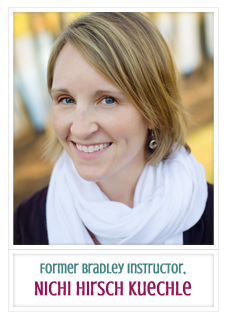 I had been a Birth Doula for almost 6 years when I had the itch to learn more about what the Bradley Method taught. In the couples I had worked with there was a marked difference in the level of empowerment, confidence and birth results that came from those who had the Bradley education. I reached out to a local Birth Doula and Bradley Instructor to see if I could observe a class. We set it up for about 6 weeks later and in the meantime we found out I was pregnant! Instead of observing, it made sense for us to take it as I loved what I had seen out of the Bradley couples I worked with. Using this method we had two successful home births (one, a water birth) with two fat little babies and two parents who couldn’t have been more proud of the experience. In my opinion, Bradley has three outstanding pillars that set it apart from other methods: nutrition, relaxation and trained support in the form of your partner. We also coach on life skills that you will take not only through your pregnancy and birthing experience but into parenthood and your own relationships. You have the opportunity to deliver your baby at home, a birth center or a hospital. ***Every week there will be simple homework tasks to prepare you for the next class. Complimentary Nutrition Response Testing Initial Visit & Report of Findings. You will gain INSTANT ACCESS to those once you complete registration. GET THE SUPPORT YOU AND YOUR PARTNER DESERVE! Mothers who implement the Bradley Method of Natural Childbirth 12 week series experience success almost 90% of the time, however, life does happen. By registering, you understand that I, Nichole Hirsch Kuechle, My Healthy Beginning, or the Bradley Method of Natural Childbirth, are not responsible for the outcome of your pregnancy, labor and delivery. I am available to you via phone and unlimited email access, though keep in mind, due to the nature of this work, I am at times unavailable to return your call or email promptly, though do my best to return calls and emails within 24 hours. Bradley Method instructors are not medical personnel. Schedule a free, no obligation 30 minute Next Step Session with me to discuss whether Nutrition Response Testing is the right fit for you. Whether or not it is a right fit, you will leave the conversation with a powerful Plan of Action.